October 18, 2018 1:28 pm. 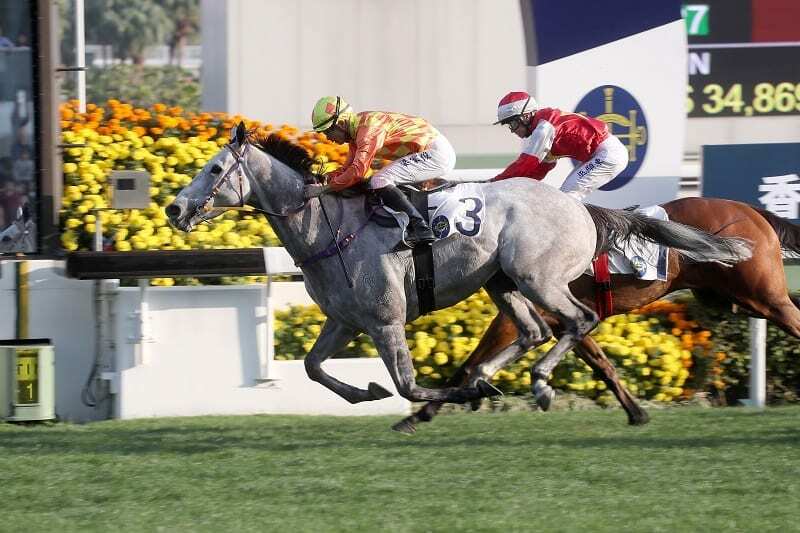 Everyone loves a grey, they say, and Hong Kong’s three best of that hue will all vie for affection in the Group 2 Premier Bowl Handicap (1200m) at Sha Tin on Sunday, 21 October. Hot King Prawn, the rising star of trainer John Size’s formidable speed cohort, took another step toward the top with victory last time over re-opposing champion sprinter Ivictory – a plain bay, alas – but a 117 rating still leaves the burgeoning four-year-old third in the grey pecking order. Ahead of him in the dappled pile are Fifty Fifty – placed in the Group 1 Stewards’ Cup (1600m) and Group 1 Queen’s Silver Jubilee Cup (1400m) last term – and the hulking Pingwu Spark, rated 123 and 119 respectively. The two gallopers are stepping out of the mile division to mix it in the 1200m sprint bracket, favouring the Premier Bowl over the same afternoon’s Group 2 Oriental Watch Sha Tin Trophy (1600m). And while trainer Benno Yung said this morning that Pingwu Spark is most likely to revert to a longer distance after the weekend, Sunday’s race could yet prove to be pivotal to Fifty Fifty’s future direction. “I’ve entered him for the Hong Kong Sprint and the Hong Kong Mile in December, so if he runs well at 1200 (metres) we might go that way,” trainer Peter Ho revealed. Fifty Fifty, the mount of Grant Van Niekerk, will need to bounce back from a below-par ninth of 14 in the Group 3 Celebration Cup Handicap (1400m) on 1 October. That was the six-year-old’s first start since he was found cast in his box last April. “He had a good break after that and then he trialled on the all-weather,” Ho said. “He hadn’t raced for six months and was not in his best form last time, but he has improved a lot since then so I preferred to go to the 1200 (metres) and see how he gets on. Yung, meanwhile, echoed Ho’s position that the strength of Sunday’s mile feature was a factor in his grey star taking up the sprint option. This time last year, Pingwu Spark’s Hong Kong record stood at two wins from three starts – all at 1200m. Having since improved his rating over 1400m and a mile, however, the Mastercraftsman gelding is likely to revert to the mile route thereafter. “The plan is to probably go to the mile trial (Jockey Club Mile) in November. If he runs very well on Sunday then we could look at the sprint races but more likely he will step back up to a mile,” Yung said of his charge, whose racing weight is well north of 1300lb. Regular partner Derek Leung will take the reins. As well as featuring champion sprinter Ivictory and rising star Hot King Prawn, the Premer Bowl Handicap sees the return of last year’s Group 1 LONGINES Hong Kong Sprint winner Mr Stunning. The afternoon’s other feature, the Group 2 Oriental Watch Sha Tin Trophy, will feature an array of Hong Kong championship title holders present and past: Beauty Generation, Pakistan Star, Time Warp, Werther and Beauty Only.